WIC is a special supplemental food program through USDA, that provides nutritious foods for women (pregnant, breast feeding, or postpartum), infants and children up to the age of 5. WIC has been shown to improve the health of pregnant women, new mothers and their infants and children. The foods provided through WIC are a good source of essential nutrients that are often missing from the diets of woman and young children. WIC participants have longer, healthier pregnancies and fewer premature births. WIC is committed to improving the health of eligible participants by providing nutrition education, breastfeeding support, healthy foods and referrals to health and social programs. The goal of the WIC Program is to decrease the risk of poor birth outcomes and improve the health of participants during critical stages of growth and development. 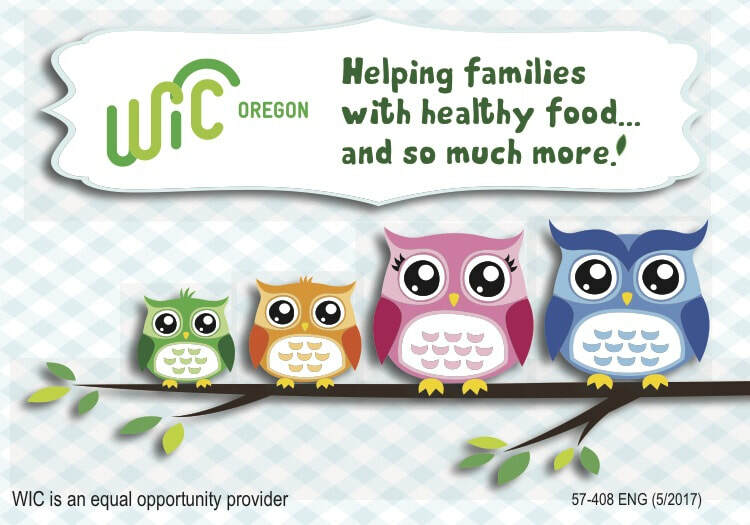 You are eligible for WIC if you live in Oregon, are a pregnant, postpartum or breastfeeding woman, an infant or child under 5 years of age, have a nutritional need, have a household income that is less than or equal to the income guidelines for the program or receive TANF, SNAP or the Oregon Health Plan. Women on WIC eat better, have healthier babies and receive early prenatal care. Children on WIC eat foods with more iron and vitamin C, and visit their doctor regularly. Answers to your nutrition questions. Breastfeeding help and a breast pump program for moms who are returning to school or work or have a medical need. Information on how to feed your child, prenatal care, breastfeeding and much more.